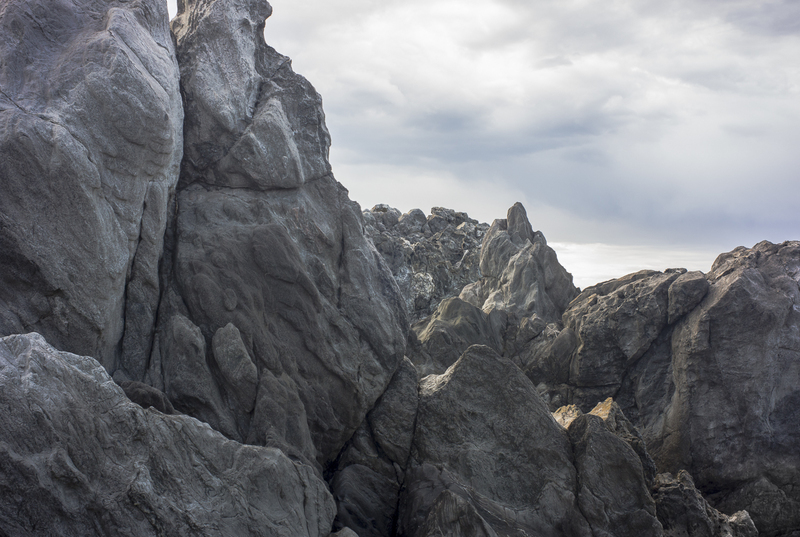 From a return visit to an old favourite coastal location to check it out--a rocky outcrop at the base of the Newland Head cliffs in Waitpinga. 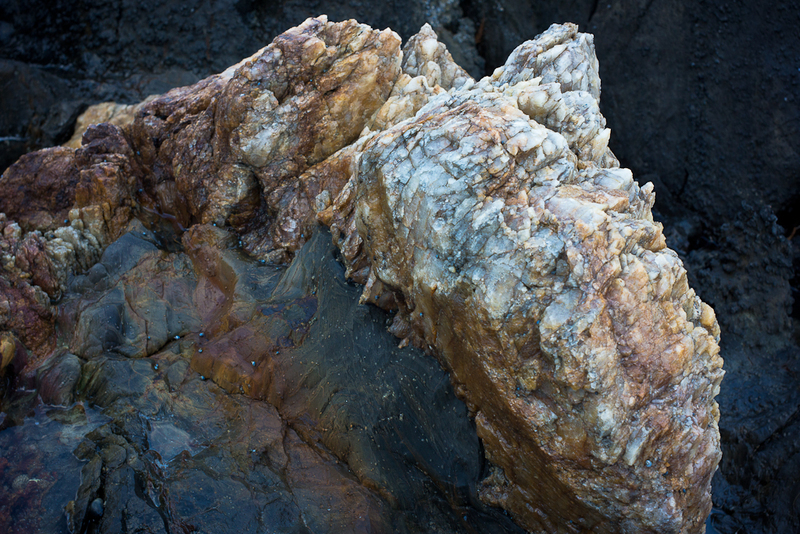 I remembered the strangeness of the site and I wanted to check it for The Littoral Zone project. Mind you that was in the winter the last time I was there. What of the early spring? Would the strangeness still be there? The soft light after the sun has gone behind the cliffs is the best time. The colours in the detail are what caught my eye this time. I spent several days camping at Wallaroo on the Yorke Peninsula with Gilbert Roe, a fellow photographer based in Adelaide. 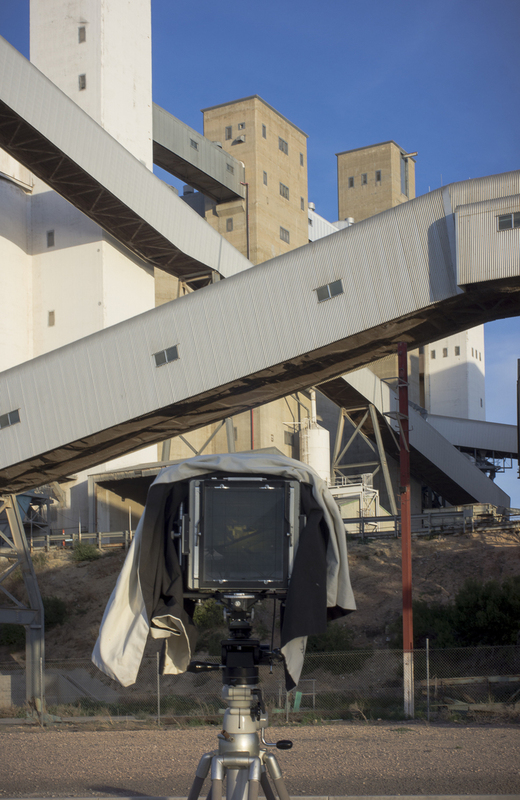 We spent the time exploring the region with our cameras: Gilbert was using his pinhole camera and I was working with my large format cameras. 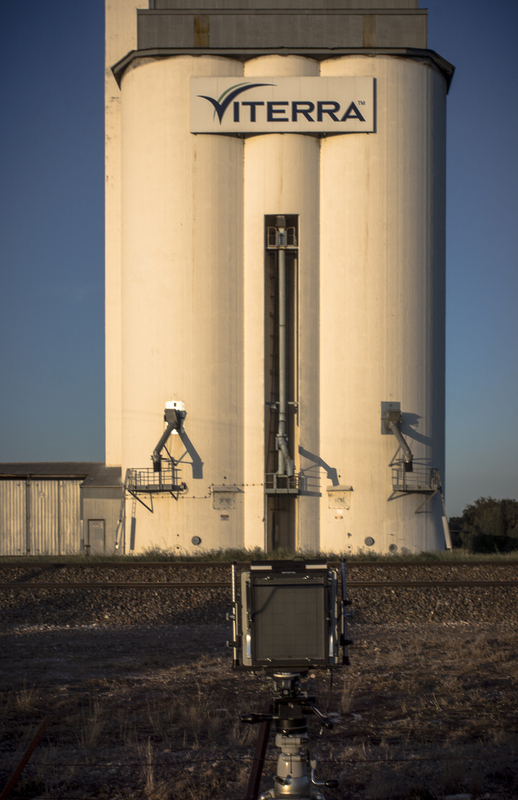 I concentrated on the silos. It was a trial run for me in terms of camping whilst being on the road with the large format equipment. Renting a house, staying in a cheap motel, or a cabin in a caravan park, is too expensive these days. Camping was a trial run because our camping gear is very old and basic, and I haven't been camping for 20 years or more. So I needed to see whether this mode of accommodation would work for me as a way of doing the photography road trips. I've started to research what happened to the Ramindjeri people, the traditional owners of the land, after the conquest of their lands and British settlement of the Fleurieu Peninsula. The settler history is a narrative of from pioneer port to seaside resort' and this narrative is premised on the the ‘great Australian silence’ in regard to Indigenous people and their history. The research is for the second historical part of Fleurieuscapes project. 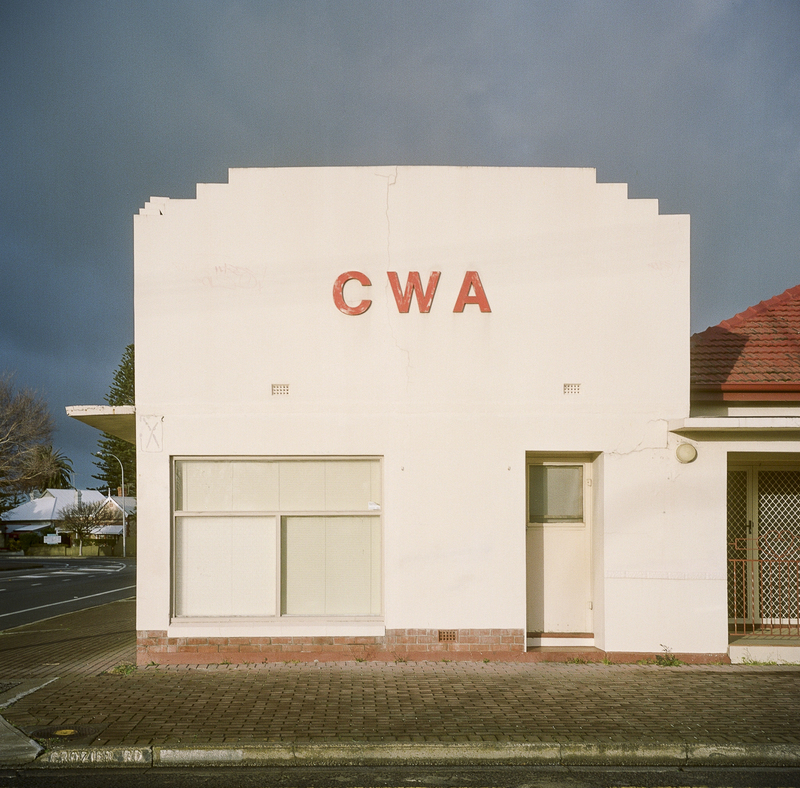 The art historical context of the project is that Australian arts practice abandoned the landscape in the 1960’s at the end of Modernism, the last major figures being Williams, Nolan and Olsen as arts practice entered post modernity and deconstruction. Whilst there are notable exceptions (Storrier, Robinson etc. ), landscape representation was left to Aboriginal peoples as Aboriginal painting emerged from the deserts of Central Australia. 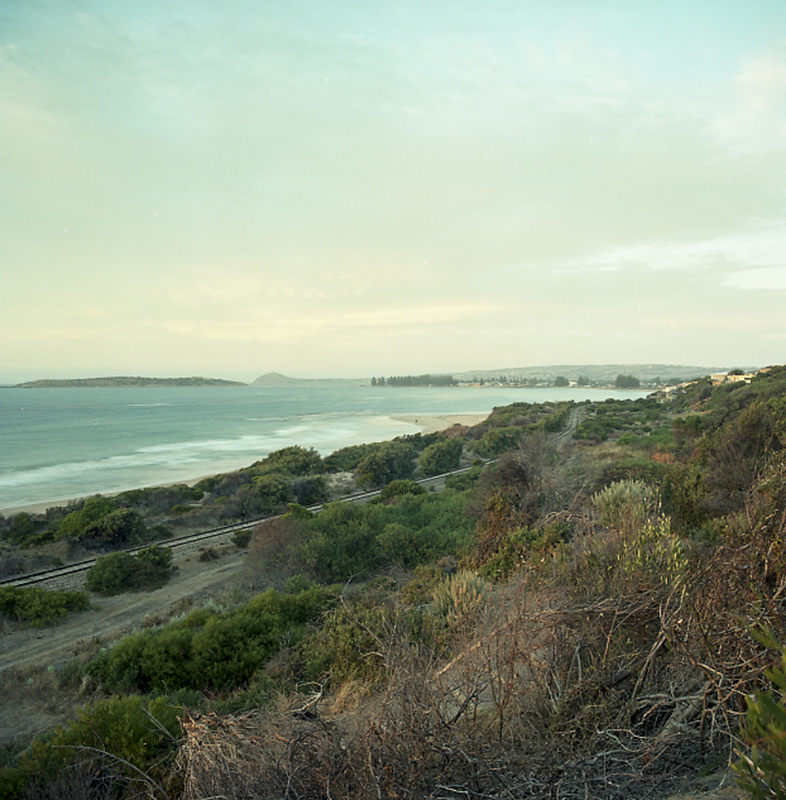 The second part of the Fleuriescapes project looks at the significant historical sites of the Fleurieu Peninsula from the vantage point of the traditional owners (both the Ramindjeri and the Ngarrindjeri) in a post-colonial Australia. This history is one where many of the traditional people living on the Fleurieu Peninsula and along the Corrong were massacred. Those who survived had the power to govern their lives removed, as well as their connections to the land and the space, and as well as their language to articulate their view of what had happened to them. The picture below is of the site of an old sealing/whaling station at Encounter Bay, Victor Harbor that preceded British settlement. The contact is circa 1830's, and one of the prime reason for the Europeans to make contact with aboriginal people was to seek women. Eventually, some of the Ramindjeri men and women worked as harpooners and whale spotters. There was another sealing/whaling station at Granite Island in Victor Harbor Many of the Ramindjeri people succumbed to the small pox epidemic which swept the area in the 1830s and then to general disease. In 1872 the whaling industry, which had started on Kangaroo Island around 1806, and which produced whale oil and bones for export, closed down due to a lack of Southern Right whales. 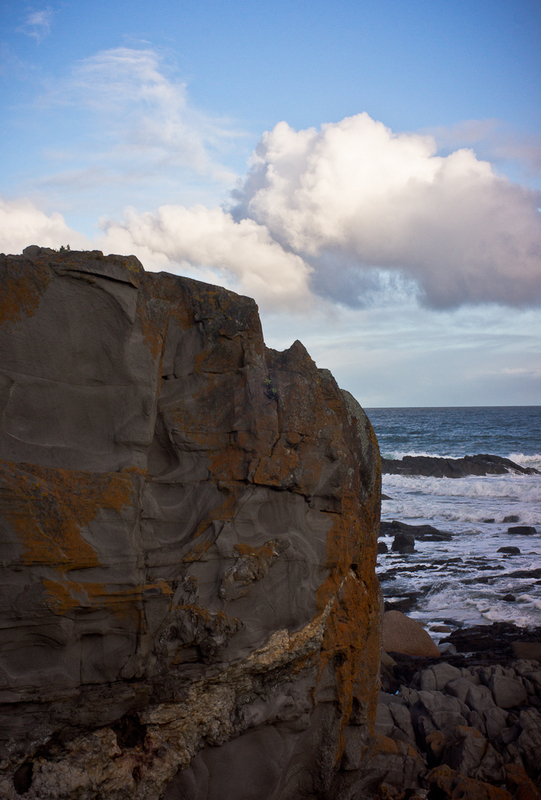 This photo is from an early morning photo shoot at Hayborough, Victor Harbor in South Australia. It is looking west to Granite Island. Rosetta Head, or The Bluff, is in the background. This was made in autumn in 2015. Autumn is a good time to photograph along the southern coast of the Fleurieu Peninsula, since the weather is more stable and predictable. The weather during spring is all over the place. We had just shifted from living in the CBD of Adelaide to the coast at Victor Harbor, and I was looking to start work on the Fleurieu Peninsula region as a place in which we belonged. I've been mulling over where to next after the Edgelands exhibition at Manning Clark House in Canberra in November 2014. What project do I pick up and start to work on? Something that is different from the topographical approach of Edgelands. 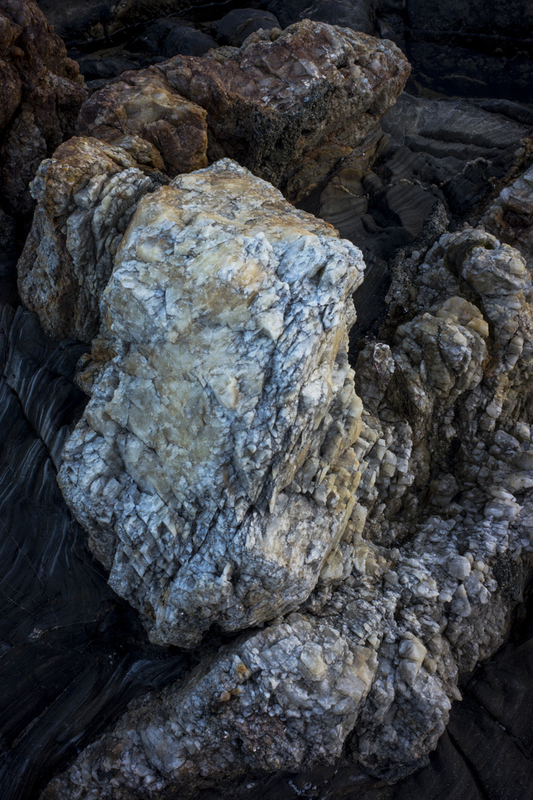 I thought that a modest exhibition of abstractions would be an easy step as I can select the images from the archives. They'd be a mixture of colour and black and white and they would include abstractions from the urban and the natural environment. I'm not sure where the exhibition would be at this stage---probably in Adelaide and possibly at the Light Gallery in late 2015. Abstractions are a bit passé these days ---retro probably, given the current emphasis on street photography. 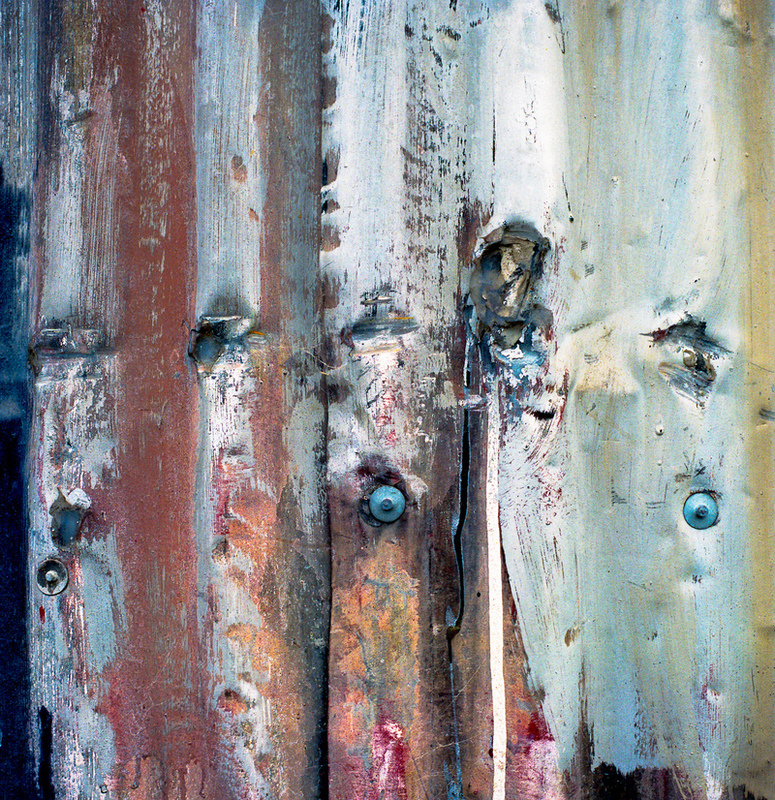 Or its a niche, even though abstraction has been intrinsic to photography. On the other hand, there is the retrospectivity of contemporary art that is nostalgic for, or repurposes, Modernist art. We could do without modernism's main themes: the transcendental, the contemplative and the timeless. The weather has been stormy along the southern coast of the Fleurieu Peninsula these last few days. 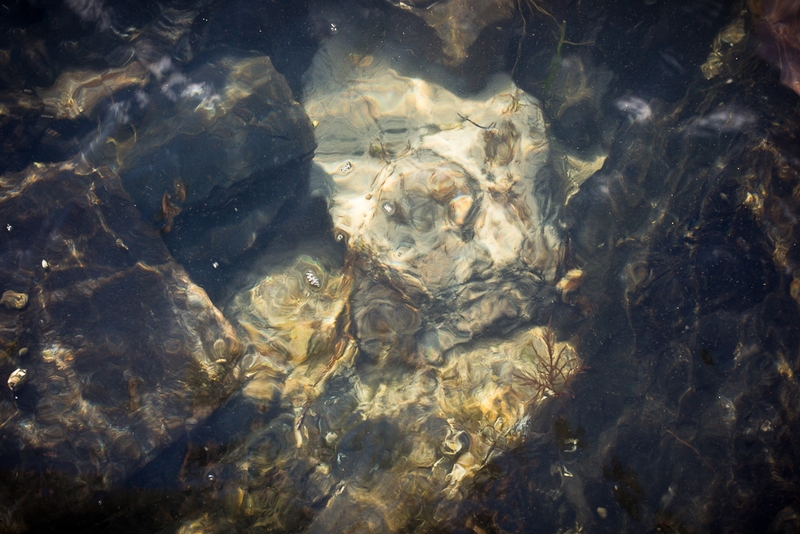 So I have sat on the rocks on the edge of the boat ramp at Encounter Bay, Victor Harbor with a digital camera making abstract photos of the water. I've done this before and I wanted to experiment with no sunlight and the early morning sunlight. Looking at the uploaded images on the computer screen afterwards I can see that sunlight works best. The lack of sunlight makes the image very drab and flat. I've started a little series of sea abstractions in the form of a DIY book. 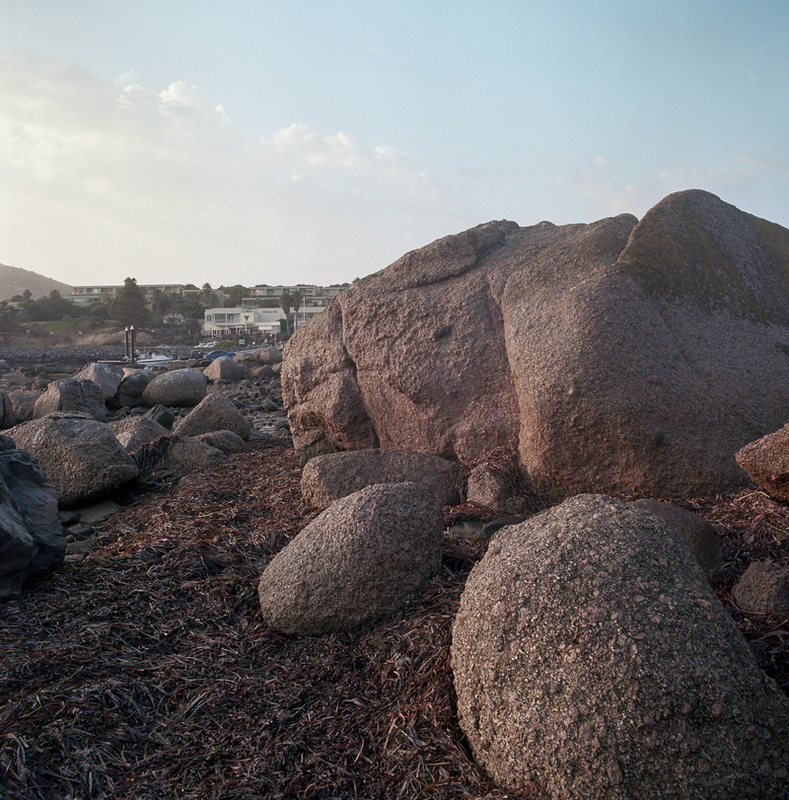 I've come down to Victor Harbor after a three week absence, which included a small trip to Melbourne. 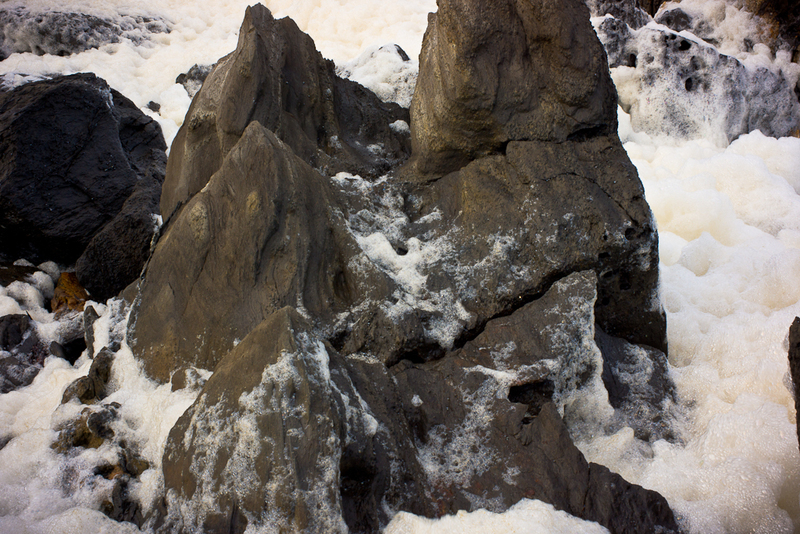 There has been a lot of rain on the Fleurieu Peninsula recently, and it was difficult to access Kings Head this afternoon due to the landslides along the Heysen Trail. It was very muddy. On the way Ari and I met a couple of photographers walking the Heysen Trail on their way to Kings Beach. They werre taking lots of photographs. One photographer had a big, fancy Nikon DSLR with a zoom lens--he also had two standard poodles which I'd previously seen --- whilst the other had a Mamyia DM22 medium format camera , which he had bought second hand from a guy in Japan for around $3000. It was cheap because it had a 3 year old 16 megapixel digital back. These kind of cameras are not readily available in Adelaide second hand. As we walked along the trail towards Kings Beach I mentioned the medium format guy that I once started out with an old Mamiya RB67, but that I found it heavy and had swiched to Rolleiflexes. He added that he also had a Mamiya RZ33 in his studio but that it was too heavy to take into the field. When I remarked about the cheapness of the digital back he said that it wasn't necessary to go beyond a 33 megapixel digital back, unless you were doing billboard posters. That was useful information for me. What I gleaned from the brief encounter was that a new digital medium format camera is now under $15,000, and it can be acquired for around $10,000 new. Suddenly a digital medium format camera becomes feasible. Ari and I pushed on to our favourite location at the foot of the Newland Cliffs to check out the tide and the wind conditions for an early morning shoot. The two guys weren't interested in coming down to the rocky outcrop--it was in deep shadow and the rocks were very wet and slippery.